Healthy eating is easier with some time saving tips like leaving out the dinner leftovers on the table adding a few more odd bits on hand and letting everyone get busy building their own power bowl for lunches the next day. Whether you follow this recipe exactly (see below) or use it for inspiration, be sure to make half your bowl vegetables and fruit. Up until recently, spaghetti squash was a new veggie for me. 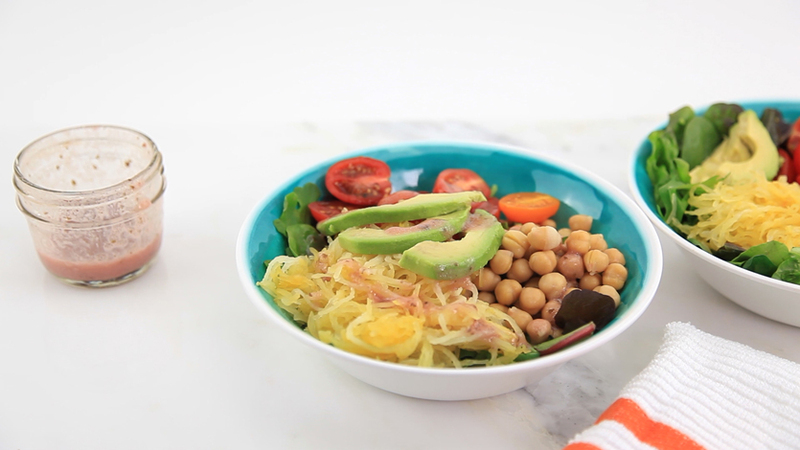 If that sounds familiar take a peak at this Spaghetti Squash 4 Ways video to help get you started enjoying this versatile veggie. Dietitian's Tip: The half your plate message applies to a power bowl, soup, stir fry, curry and casserole. Load on the veggies and you'll be healthier for it! *Kids Cook: I love the idea of putting school-age kids in charge of keeping the fridge stocked with homemade salad dressing. Make basil vinaigrette. In bowl or jar, mix together 2 tbsp canola oil, 1 tbsp red wine vinegar, 1 tsp Dijon mustard, ½ tsp dried basil and pinch of salt and pepper. You can double or even triple this recipe to make more, if you wish. In a medium-size bowl, combine 2 cups of your favourite salad greens and some sliced cherry tomatoes, about 1 cup EACH shredded spaghetti squash and canned chickpeas (rinsed). Top with a few slices of avocado and dig in! • Try this in a mason jar for a meal on the go. Start with basil vinaigrette on the bottom and layer up ingredients ending with salad greens. Give it all a good shake when you are ready to dig in. What can I do if my child likes to eat the same thing for lunch every day?